Objective To evaluate clinical practice of volume-targeted ventilation (VTV). Design Internet-based survey of all 50 tertiary neonatal units in Australia, New Zealand, Sweden, Denmark, Finland and Norway. Results Response rate was 100%. VTV was routinely used in 25 (50%) units; 15/25 (60%) in Australasia and 10/25 (40%) in the Nordic countries. The most common reason given for using VTV was that it reduces bronchopulmonary dysplasia (13/25; 52%). The median (IQR) of upper limits of target tidal volume were (1) for initial ventilation of preterm infants with respiratory distress syndrome 5.0 (4.6–6.0) ml/kg and (2) for infants with ventilator-dependent bronchopulmonary dysplasia 6.0 (5.0–8.0) ml/kg. The median (IQR) maximum peak inspiratory pressure limit units were prepared to use in VTV-mode was 35 (30–42.5) cm H2O. Conclusion Half of the units used VTV routinely, but with a considerable variation in VTV practice. More studies are required to establish best VTV practice. Pressure-limited ventilation (PLV) has been the primary mode of neonatal mechanical ventilation for the last four decades. During PLV, tidal volume (VT) delivery fluctuates due to variations in lung compliance and respiratory effort. This may lead to overexpansion (volutrauma) or low VT, with increased work of breathing and acidosis.1 Modern microprocessor-controlled ventilators allow volume-targeted ventilation (VTV) with reduced VT variability.2 Systematic review has shown that VTV, compared with PLV, reduces duration of ventilation, rate of pneumothorax and rate of severe intraventricular haemorrhage.3 However, different VTV-modes make interpretation of evidence difficult. The objective of this survey was to evaluate clinical practice of VTV in the Nordic countries and Australasia. A web-based email survey (Appendix A) was sent to the lead neonatologists at all 50 tertiary neonatal units in Australia (19), New Zealand (6), Sweden (8), Denmark (3), Finland (5) and Norway (9). Questions included the annual number of extremely low birth weight infants admitted, the ventilators in use and ventilator-settings for initial management of intubated preterm infants with respiratory distress syndrome (RDS). Units using VTV were asked about perceived benefits of VTV, selection and adjustment of ventilator settings for different clinical scenarios and their approach to weaning. Units not using VTV were asked why they did not use this mode. Follow-up for non-responders was by email and phone. A second consultant was approached if needed. ▶ Evidence suggests that volume-targeted ventilation (VTV), compared with pressure-limited ventilation, improves outcomes in preterm infants. ▶ Previous studies within Europe have reported a low use of VTV. ▶ VTV is currently used in half of all tertiary units in Australasia and the Nordic countries. ▶ Differences in use and variation in clinical practice indicate the need for further trials delineating best volume targeting practice. Response rate was 100%. For intubated preterm infants with RDS on the first day of life, initial respiratory support was provided using conventional ventilation in 49 units (98%) and high-frequency ventilation in one unit (2%). All units using conventional ventilation used a synchronised mode with inspiratory triggering; 37/49 (75.5%) assist-control (AC) and 12/49 (24.5%) synchronized intermittent mandatory ventilation. Twenty-five units (50%) routinely used VTV; Australia (12/19; 63%), New Zealand (3/6; 50%), Sweden (1/8; 12.5%), Denmark (3/3; 100%), Finland (1/5; 20%), Norway (5/9; 55.5%). There was no correlation between the size of the unit and likelihood of routine VTV use. Twenty of the 25 (80%) units using VTV used the Dräger Babylog 8000 plus in Volume Guarantee (VG) mode. VTV was mainly used in conjunction with AC-mode (21/25; 84%). Fourteen of 25 (56%) units using VTV responded that the most important benefit of VTV was to reduce bronchopulmonary dysplasia (BPD). Other reasons considered important by at least 40% of the units using VTV included (1) more stable CO2, (2) reduction in air leak, (3) reduced need for blood gases and (4) easier weaning. The main reasons for not using VTV were the belief that clinical outcomes using their current ventilation strategy were good (13/25; 52%) or that there was insufficient evidence of benefit of VTV (11/25; 44%). Three units reported not having ventilators capable of delivering VTV. 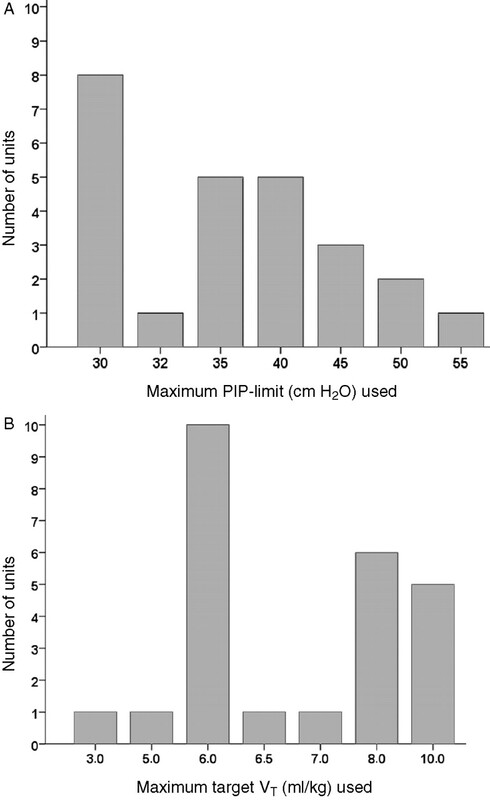 Twelve of 25 (48%) units using VTV set the maximum peak inspiratory pressure (PIP) limit during VTV 2–5 cm H2O above the PIP needed to achieve target VT, and 11 (44%) set the PIP limit at the same level as PIP used prior to VTV. Twenty-three of 25 units (92%) would further increase the PIP-limit if target VT was not being achieved. The maximum PIP-limits that units were prepared to use are shown in fig 1A. Maximum limits for (A) peak inspiratory pressure (top) and (B) target VT (bottom) peak inspiratory pressure (right) that the 25 units using volume-targeted ventilation were prepared to use in extreme clinical situations (categorical axes). Units were asked to specify their lower and upper limits of target VT for different clinical scenarios (table 1). There were no differences in target VT settings between preterm infants with a birth weight of 600 and 1200 g. For infants with ventilator-dependant BPD, the upper limit target VT was higher than for the other clinical situations. The maximum target VT that units were prepared to use ‘in extremis’ is shown in fig 1B. Twelve of 25 (48%) units reported reducing target VT as part of their weaning strategy, however the reported values were not statistically different from target VT for RDS on day 1 (table 1). VTV use varied across the countries surveyed, with only 2 of 13 units in Sweden and Finland using the technique. Many centres in these countries believed there is insufficient evidence of benefit of VTV over other ventilation modes. This may reflect the lack of large multi-centre trials comparing VTV to PLV. Good experience with their current practice was also a common reason for not using VTV. Ventilators offering VTV differ substantially in how they measure and control VT delivery, the clinical benefits and risks of which have not yet been studied. The most commonly reported form of VTV used in this study was the VG mode on the Dräger Babylog 8000 plus. As units become experienced with this particular mode of VTV delivery, trials comparing VG mode with other ventilation strategies will become more difficult to conduct. Our intention with this survey was to identify unit practice. We asked specifically for the ‘policy of the unit’. However, as a single neonatologist answered the survey on behalf of each unit, personal preference cannot be excluded. Data on actual target VT used during clinical care was not collected so caution should be used when comparing our results with studies reporting specific target VT. The 100% response rate from all tertiary neonatal units surveyed provides an updated overview of the breadth of neonatal VTV strategies used in these six countries at the end of 2009. As evidence supporting VTV has emerged, use of the technique has increased. Half of the units in the six countries surveyed now routinely use VTV for preterm infants with RDS. Evidence regarding the optimal range of target VT in different clinical situations is limited and there is a range of clinical practice. Further trials to identify optimal VTV delivery and target VT in different patient populations are urgently needed. The authors thank Jeanie Cheong for critically reading the manuscript and the following neonatal units for providing data for this survey.
. State of the art in conventional mechanical ventilation. J Perinatol 2009;29:262–75.
. Volume guarantee: stability of tidal volume and incidence of hypocarbia. Pediatr Pulmonol 2004;38:240–5.
. Volume-targeted versus pressure-limited ventilation in the neonate. Cochrane Database Syst Rev 2005;3:CD003666.
. Survey of neonatal respiratory support strategies. Acta Paediatr 2007;96:1115–17.
. Work of breathing and different levels of volume-targeted ventilation. Pediatrics 2009;123:e679–84.
. Evolution of tidal volume requirement during the first 3 weeks of life in infants <800 g ventilated with Volume Guarantee. Arch Dis Child Fetal Neonatal Ed 2009;94:F279–82.
. The impact of instrumental dead-space in volume-targeted ventilation of the extremely low birth weight (ELBW) infant. Pediatr Pulmonol 2009;44:128–33. In Australia The Townsville Hospital, Townsville; Mater Mothers' Hospital, Brisbane; Royal Brisbane and Women's Hospital, Brisbane; John Hunter Children's Hospital, Newcastle; Royal Prince Alfred Hospital, Sydney; Nepean Hospital, Sydney; Liverpool Hospital, Liverpool; Royal Hospital for Women, Sydney; Royal North Shore Hospital, Sydney; Westmead Hospital, Sydney; The Canberra hospital, Canberra; Mercy Hospital for Women, Melbourne; Monash Medical Centre, Melbourne; The Royal Women's Hospital, Melbourne; Royal Hobart Hospital, Hobart; Flinders Medical Centre, Adelaide; Women's and Children's Hospital, Adelaide; King Edward Memorial Hospital for Women, Perth; Princess Margaret Hospital for Children, Perth. In New Zealand National Women's Health, Auckland; Middlemore Hospital, Auckland; Waikato Hospital, Hamilton; Wellington Regional Hospital, Wellington; Christchurch Women's Hospital, Christchurch; Dunedin Hospital, Dunedin. In Sweden Örebro University hospital, Örebro; Karolinska University Hospital-Astrid Lindgren Solna, Stockholm; Karolinska University Hospital-Huddinge, Stockholm, Sahlgrenska University Hospital, Gothenburg; Linköping University Hospital, Linköping; Norrland University Hospital, Umeå; Uppsala University Hospital, Uppsala; Lund University Hospital, Lund. In Denmark Odense University Hospital, Odense; Rigshospitalet, Copenhagen; Århus University Hospital, Århus. In Finland Helsinki University Central Hospital, Helsinki; Turku University Hospital, Turku; Oulu University Hospital, Oulu; Kuopio University Hospital, Kuopio; Tampere University Hospital, Tampere. In Norway Oslo University Hospital-Rikshospitalet, Oslo; Oslo University Hospital-Ullevål, Oslo; Akershus University Hospital, Lørenskog; Stavanger University Hospital, Stavanger; Haukeland University Hospital, Bergen; Health Sunnmøre Trust, Ålesund, St. Olav University Hospital, Trondheim; Nordland Central Hospital, Bodø; University Hospital of North Norway, Tromsø. Funding KIW is supported in part by a Monash International Postgraduate Research Scholarship. PGD is supported in part by an Australian National Health and Medical Research Council Practitioner Fellowship. The research was funded by Australian National Health and Medical Research Council Program Grant no. 384100.